Feelin' groovy? Sylvia Woods' spiffy collection of 40 songs from the 1960s will inspire you to put on your embroidered bell-bottoms and wear some flowers in your hair. Some of the pieces can be played by beginning harp players, but most are at advanced beginner to intermediate levels. Fingerings, lyrics and chord symbols are included. Pieces are in C or sharp keys, and can be played on either lever or pedal harp. About half of the songs do not have any lever changes within the pieces. 96 pages, spiral-bound. Includes TV and movie themes, and music by: Burt Bacharach and Hal David; Bob Dylan; Tony Hatch; Justin Hayward; Mick Jagger and Keith Richards; Gerard Marsden; John Phillips; Nino Rota; John Sebastian; Paul Simon; Jerry Jeff Walker; Brian Wilson; and more. 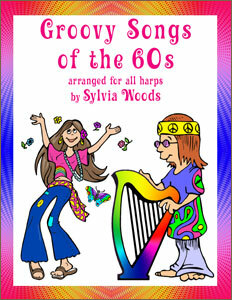 Includes songs made popular by: The Animals; The Association; The Beach Boys; Jimmy Clanton; Petula Clark; Judy Collins; Donovan; Bob Dylan; The Fifth Dimension; Jerry and the Pacemakers; The Lovin' Spoonful; Joni Mitchell; The Moody Blues; The Nitty Gritty Dirt Band; Peter, Paul and Mary; Elvis Presley; The Rolling Stones; Simon and Garfunkel; The Turtles; Dionn Warwick; The Youngbloods; and others. A Time for Us (What is a Youth) from "Romeo and Juliet"